4.5 million years ago or so, our Solar System grew from a gas cloud that circled its own center counterclockwise, cooled, and formed both our sun and a dimmer pair-star, a subbrown dwarf, Nemesis. Both the sun and Nemesis developed planets that circled them. Tiamat, the very watery planet that would become Earth, orbited the sun between the orbits of Jupiter and Mars. The ancient Enuma Elish relates how, 4.5 billion years ago, our sun created Tiamat, then Mercury. The sun blew comets with water and meteorites with gold from Mercury to Earth. Planet-pairs formed: Venus/Mars, Jupiter/Saturn, and Uranus/Neptune. These planets orbited the Sun counterclockwise, as did Tiamat. No planet orbited between Venus and Jupiter, where the Earth now resides. Pluto was a moon of Saturn. Tiamat lacked a partner-planet, but one of her moons, Kingu, enlarged. Kingu started to partner with Tiamat. Then Kingu could orbit the Sun, not Tiamat. Around four billion years ago, Evil Wind (a moon of Nibiru) hit Tiamat. Then Nibiru hit Tiamat and scattered rocks—the asteroids–from Tiamat into orbit between Jupiter and Mars. When Nibiru hit it also knocked the chunk of Tiamat that became Earth into orbit between Mars and Venus. The gap in our chunk of Tiamat became our Pacific Gap, a hole in the surviving planet, a hole without a crust. Nibiru attained a clockwise 3,600-year orbit around Nemesis and back through the Solaris System between Mars’ and Jupiter’s orbits. Nibiru went through regions of great cold when distant from both Nemesis and Solaris. Intense radiation and heat hit Nibiru as it neared Solaris. But Nibiru’s volcanoes kept spewing ash into its atmosphere, so that in the cold parts of its orbit, ash kept Nibiru’s inner heat within its atmosphere. As it neared Solaris, ash shielded Nibiru from Solaris’ heat and radiation. Sirians, advanced beings from the Lyran stars, moved to planets in the Pleiades (above and to the right of Orion’s belt). 60 million years ago, Homo Sapien the Pleiadians rocketed to Earth to escape war. Other Lyrans and Pleiadians came to Earth” and created wars on Earth too. The first Pleiadians fled back to the Pleiades, some to Nibiru. The Nibirans developed technologically advanced warring nation-states* [Horn, A. and L., 1994, Humanity’s Extraterrestrial Origins, Silberschnur; Sitchin, Z., The Lost Book of Enki : 25-26]. 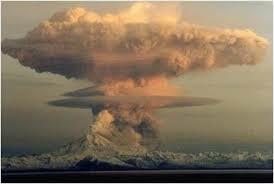 Nuclear explosions and fallout left many Nibirans sterile and killed off a huge percentage of men. To end the war, leaders drew lots for rule of the planet. AN won the drawing and created Agade, the new capitol. As King, An imposed military rule–hierarchical, male-centered, patrilineal—and issued decrees. An ordered men, “Take principle and secondary wives, official concubines too.” His successors set The Law of Succession: when the King dies, his son with his father’s half-sister succeeds. Anu, Lahma’s successor, cancelled planned marriage of Anu’s son eldest son Enki (called then Ea) to Ninmah, who’d borne a boy–Ninurta—with Enlil, Anu’s second son. Enlil‘s mother was Anu’s father’s half-sister. She outranked Enki’s mother. In 470,000B.C. or so, Prince ALALU killed Lahma and pacified Anu, Lahma’s successor. Alalu gave his daughter DAMKINA to Enki, Anu’s first son. The boy Enki and Damkina begat would succeed as Nibiru’s king. Alalu ruled now, Anu would attend him as Cupbearer. Damkina and Enki begat Marduk and prepped him to rule Nibiru. Alalu nuked the volcanoes to spew an ash shield about Nibiru. The bombs didn’t activate eruptions. The atmosphere’s hole grew. Alalu also sent fifty scientists to the Asteroids for gold. A rock hit their rocket and killed them all. 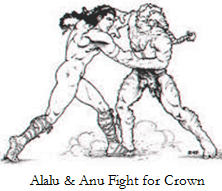 Then, around, 400,500B.C., Anu challenged Alalu to wrestle for rule. Anu won. Alalu escaped to Earth in a rocket loaded with missiles for nuking volcanoes. On Earth, he confirmed gold, targeted Agade with his nukes. “Return my Crown,” he demanded. Anu, now King, declared void the deal he’d made with Alalu—that Marduk would next rule Nibiru. As per The Law of Succession, Enlil, who descended from Anu and his half-sister–not Marduk–said Anu, would succeed him. In 440,000B.C. Anu sent son Enki to Earth to mediate with Alalu, Enki’s father-in-law. With Enki, Anu sent fifty men and Alalu’s grandson, astronavigator ANZU. Enki had pre-empted the job half-brother Enlil coveted. Enlil seethed while Enki and Anzu rocketed for Earth. En route, they landed on Mars. Mars had lakes and thin air. * PLEIADES, HOME OF THE NIBIRANS? Royal and Priest wrote “400 to 500 light years from Earth, the Pleiades is an open star cluster of 250-500 stars in the constellation Taurus. “The Pleiadians, seen in ancient Egypt as representing seven aspects of Hathor/Ninmah splintered, say Royal and Priest, off from the Lyran group. Mainly caucasian, with a lot of variety, as on Earth. They ranged from 5 feet to 7 feet, eyes are bigger and different in color than ours. “Many Blonds or Nordic type aliens that contactees encounter say they come from the Pleiades. Yale Ph.D. anthropologist Arthur Horn and his wife Lynette review physical evidence, ancient writings, channeled material and ET contact data of Earth’s history. The Horns, IMHO, follow Occam’s idea: the theory that includes all known info and best predicts new data is best for now. The Horns’ review of the fossil record completely agrees with Lloyd Pye’s analysis, that terraformers introduced and genetically modified Earth’s species. The Horns and Pye both conclude that no species evolved on Earth from any other. Terraformers introduced the sequence of life forms that have lived on our planet. The Horns also confirm Zecharia Sitchin’s analysis of parts of the Bible as its writers’ distortions of ancient Sumerian knowledge as propaganda for their ET boss. The Horns share channel Lyssa Royal’s version of a sequence of Terraformers who developed Earth’s lifeforms. In the beginning, Royal says, the Divine Creative Existence entered a White Hole near the constellation Lyra, 2,300 light years–abbreviated “ly”–from where Earth later formed. The White Hole separated the Divine as a prism separates color frequencies. Through the white hole prism, the Divine sorted itself into the Founders, as well as fragments programmed to learn how to embrace and distinguish both diversity and unity. When the Divine passed through the White Hole prism Lyra, it also created the physical universe of atoms, gases, stars and planets. Project terraformers gave Earth flowering plants and all the placental mammals. 65 million years ago, the Project directors sent an extraterrestrial body crashing into Earth to decimate the dinosaurs and ready the planet for advanced primates. Civilizations that warred, dominated and controlled fought incessantly in the Lyran system. Some of them moved on from Syrius to the Orion stars, 1,344 lightyears from our Sun. Others rocketed to the Pleiades 440 lightyears from Earth; they brought war with them. 60 million years ago, Pleiadians, whom Royal calls “Earth-Lyrans,” rocketed to Earth to escape war. On Earth, they “mixed some of their genes with the genes of Earth primates” the Founders had already introduced to Earth. The Pleiadians seeded Earth and adapted their genome for life here, life that had already been genetically prepared by Lyrans sent by the Founders to adapt Earth for higher primates. But soon, says Royal, other Lyrans and Pleiadians came here. They brought war, enslaved humans, made us worship them as gods and inflicted cruelties on us. At times the Earth-Lyran-Pleiadians allied with the Anunnaki, the geneticists who created us 300,000 – 200,000 years ago. At other times, the Earth-Lyrans fought the Anunnaki and the enhanced half-breed Anunnaki-Earthlings the Anunnaki continued to beget. When the Anunnaki (who were fully Homo Sapien Pleiadians from the planet Nibiru) came to Earth 450,000 years ago, they added a bit of copper, clay and a few genes from the advanced hominoid, Homo Erectus, to their genome to make Earth-adapted humans–us.